Separate the eggs in two bowls. (Be extra careful not to get any yolk in the whites as this will prevent them from whipping properly.) Melt and brown the butter, then set aside to cool to room temperature. Whip the egg whites to stiff peak. (Turn the bowl upside down to test whether they are stiff. If they don’t fall apart, you?re good.) Mix cornmeal, flour, egg yolks, sugar, salt, baking powder, milk and 1/4 cup browned butter together. When egg whites are whipped, fold them into the liquid mixture until fully incorporated. Pour about 2 tablespoons per cake on a hot griddle or skillet greased as needed with the remaining butter until golden brown and delicious. For “silver dollar” size cakes, use about 1 tablespoon per cake. Lift an edge to check for color before turning and cooking the other side. Each side requires about 1 1/2 to 2 minutes, depending on size. The center needs to be fully cooked, so don’t make cake too large. Cook in batches as needed. These versatile cakes can go sweet or savory. 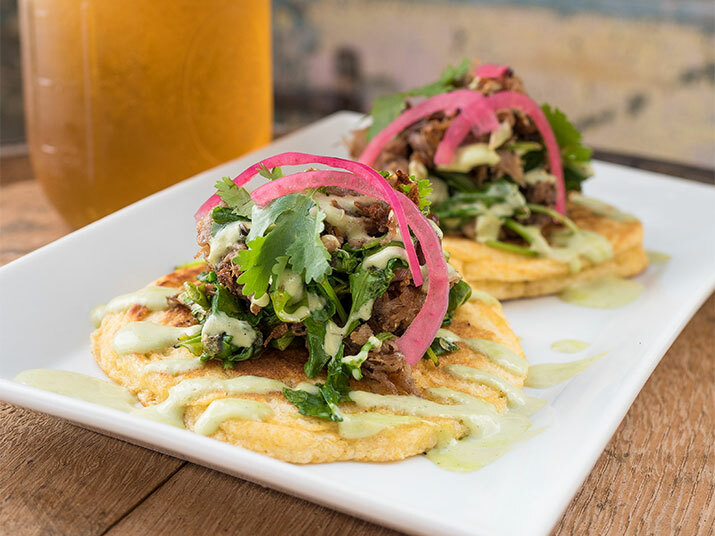 The Bayou presents them as an appetizer with duck confit, arugula, cilantro aioli and pickled red onion, but they are a great alternative to traditional pancakes at breakfast or brunch, topped with butter, fruit and your favorite syrup.